This Fun Knee Length Bridesmaids Dress Features a Lace Overlay Draped Bodice and Flowy Chiffon Skirt. Criss Cross Back Straps Complete the Look. Zipper Back. Shown in Eggplant. Available in All Solid Lace Color Options. Stylish A-Line, Chiffon Gown with Skirt Slit and Beaded Waistline Band. The Off-the-Shoulder, Softly Flounced Front and Back Neckline Has a Keyhole Back Detail and Back Zipper. Softly Draped, A-Line Chiffon Gown with Scooped Neckline, Flounced Off-the-Shoulder Strap Detail and Scoop Back with Zipper. 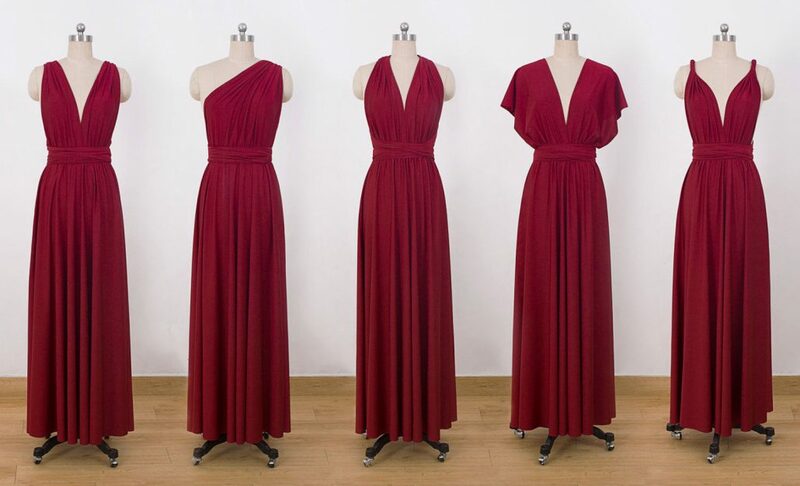 Simple and Elegant, This Sleeveless A-Line Chiffon Bridesmaids Dress Features a V Neckline and Asymmetrical Draping Along the Natural Waist. Delicately Beaded Embroidery on Net over Flowing Chiffon A-Line Gown. The V-Neckline, Off-the-Shoulder Sleeves Follow Around to the Keyhole Back Neckline with Zipper. Ruffles Flutter Over One Shoulder to Create a Soft and Graceful Silhouette on This Bridesmaids Dress. Matching Tie Sash Included. Zipper Back. 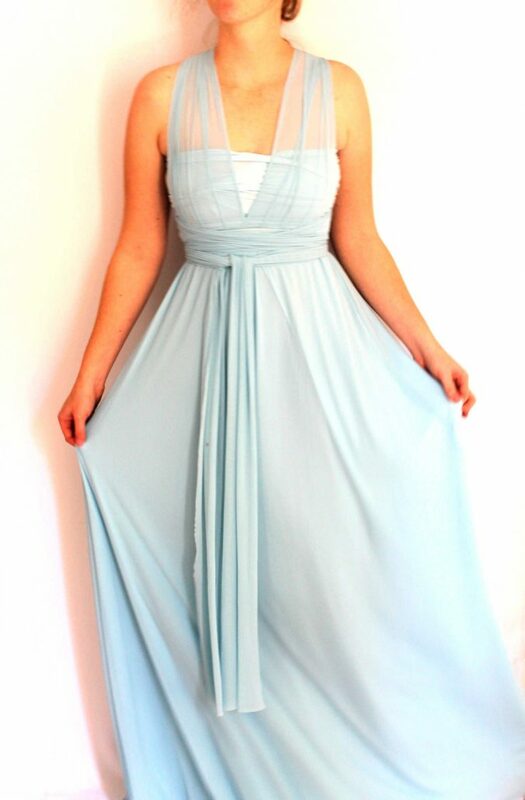 This Glamorous One Shoulder Chiffon Bridesmaids Dress Features a Removable Shoulder Bow and Flowy A-line Silhouette. Intricate Beading Embellishes the Illusion Bodice of this Chic Chiffon A-Line Bridesmaids Dress. An Illusion Racer Back Completes the Look. Zipper Back. Chic Chiffon A-Line Bridesmaids Dress made in patterned sequins fabric. Back with cowl and zip. Chic Chiffon Bridesmaid Dress Featuring a Ruched Sweetheart Bodice with V Strap Detail. A Diamond Keyhole Back and Flowy A-Line Skirt with Pockets Complete the Look. 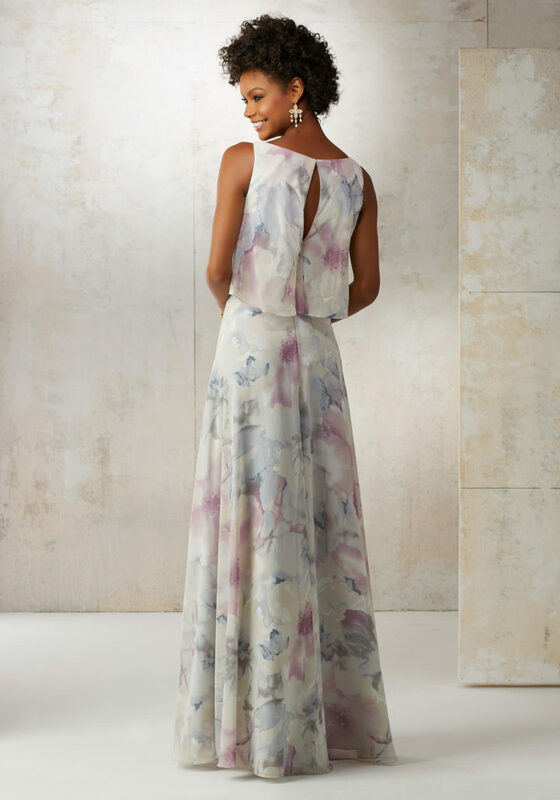 Timeless Chiffon Bridesmaid Dress Featuring a Classic Off the Shoulder Neckline. Sophisticated, High Halter, Keyhole Neckline on an A-Line Chiffon Gown. Chic, Strappy Back with Scoop Back Neckline and Zipper. Boho Chiffon Bridesmaid Dress Featuring a Deep V-Neckline and Delicate Flutter Sleeves. An Open Back and Thin Tie Sash at the Waist Complete the Look. Elaborate Embroidery and Beading Accents the Bodice of This Beautiful Chiffon Bridesmaids Dress. An Illusion Neckline and Matching Waistband Complete the Look. 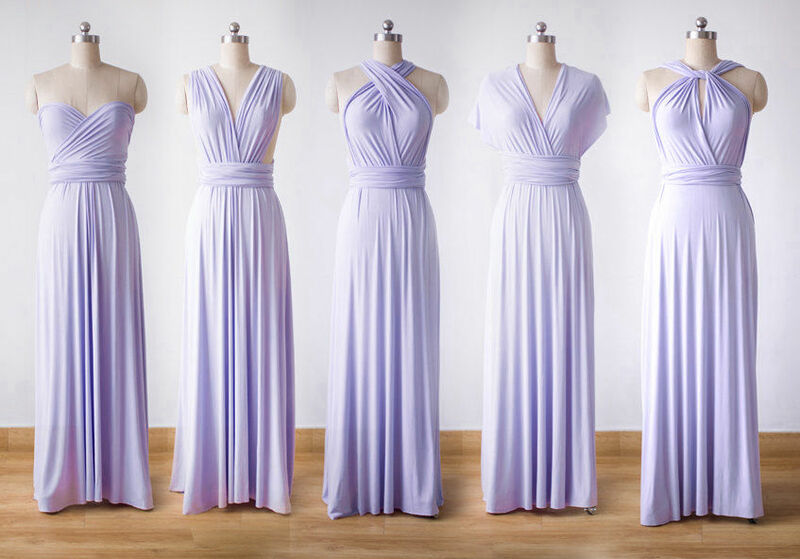 Simple and Elegant, This Sleeveless A-Line Chiffon Bridesmaids Dress Features a V Neckline and Draped Overlay Back. Shown in Peach. Sophisticated, A-Line Chiffon Gown with Stylish, Flounced, Cold-Shoulder Detail and Criss-Cross Back Straps with Zipper Back. 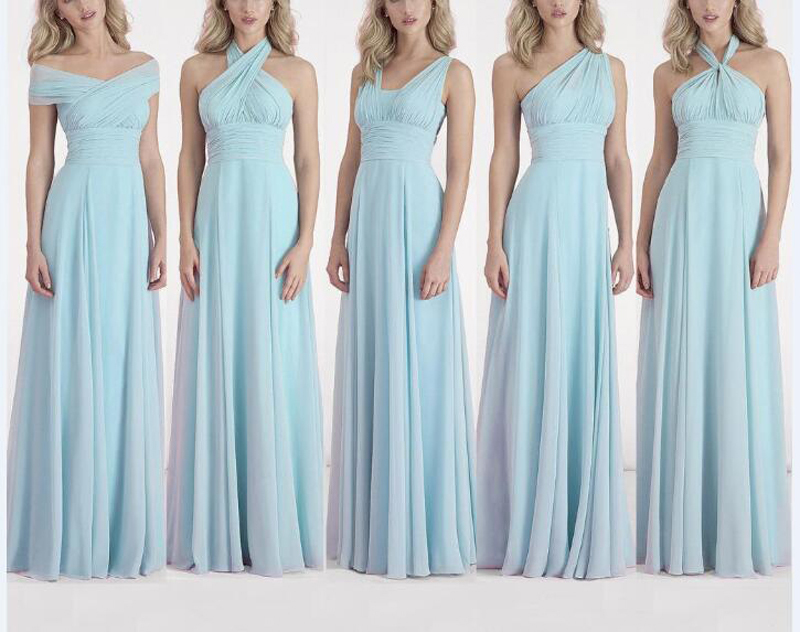 Strapless Chiffon Bridesmaids Dress Featuring a Sweetheart Neckline and an Asymetrically Ruched Waist. A Cascading Ruffle at the Hip Completes the Look. Zipper Back. Shown in Cream Petal. Available in Printed Chiffon or All Solid Chiffon Color Options. Elegant Beaded Lace Bridesmaid Dress with Spaghetti Straps Designed by Madeline Gardner. Timeless Lace Morilee Bridesmaid Dress with Corset Bodice. 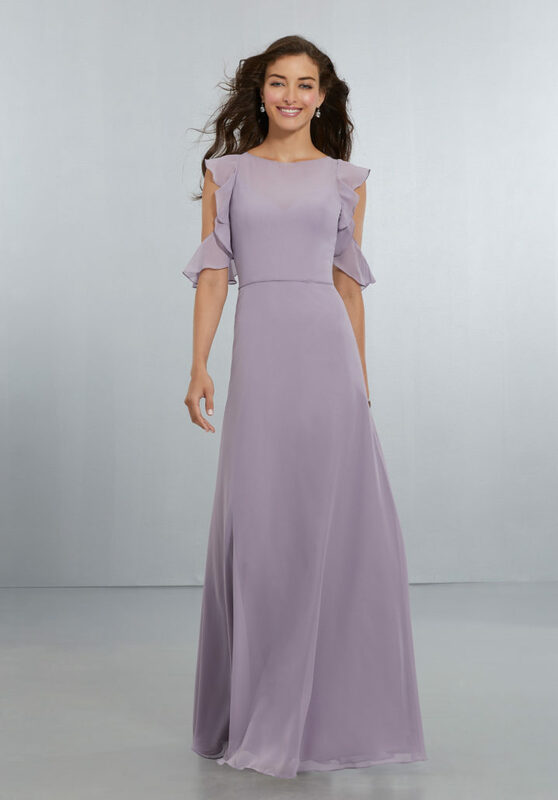 Chiffon Bridesmaid Dress Featuring a Figure Flattering A-Line Silhouette and Asymmetrically Draped Bodice. Beaded Shoulder Straps and a Delicately Beaded Waistline Complete the Look. View the Chiffon Swatch Card for Color Options. Shown in Silver. The is an all-lace strapless dress with a gorgeous crystal belt, crowned with a slight sweetheart neckline and a low-cut, wide V-back. Princess seaming tapers the bodice to the cinched-in waist, contrasted with a skater skirt that completes this A-line cocktail dress. Available Colors: blue, burgundy, navy, pink, white. Exclusive Italian shimmer mesh fabric combined with sparkling sequence. Tailored sweetheart bandeau giving the extra elegant touch. Elegant mesh with stylish mesh straps. Tailored with a sweetheart bandeau attached for the classic look. Long sleeve wrap Infinity dress. Two piece dress, 11 ways to wear it! Vintage style separate lace top wraps over a separate sweetheart bandeau dress. Tailored Sweetheart bandeau for the classic look.